Synopsis: A beautiful and contemporary retelling of Colin Thiele's classic Australian tale. 'Storm Boy' has grown up to be Michael Kingley, a successful retired businessman and grandfather. When Kingley starts to see images from his past that he can't explain, he is forced to remember his long-forgotten childhood, growing up on an isolated coastline with his father. He recounts to his grand-daughter the story of how, as a boy, he rescued and raised an extraordinary orphaned pelican, Mr Percival. Their remarkable adventures and very special bond has a profound effect on all their lives. Based on the beloved book, Storm Boy is a timeless story of an unusual and unconditional friendship. Colin Thiele’s novella Storm Boy, which tells the story of a young boy and his extraordinary friendship with an orphaned pelican on South Australia’s remote Coorong National Park, has enchanted and moved Australians for over half a century. Sydney based producer MATTHEW STREET (TOMORROW, WHEN THE WAR BEGAN, THE BANK JOB, W, THE MESSENGER) had studied the book in primary school, as many Australian school children still do, a memory that drew him in 2013 to take notice of a new stage adaptation. Street and Boughen had both seen the 1976 film adaptation and strongly recalled the emotional connection they had with it. The producers recognised that the themes of Thiele’s 1963 book are just as relevant, and in some ways more so, today. From the outset, the producers wanted to ensure that the new film would have at its centre the spirit of what makes people want to read Thiele’s book more than 50 years after its first publication. However, STORM BOY would not be a remake of the 1976 film. As such, Boughen and Street decided to remain true to Thiele’s original setting; the late 1950s. Additionally, Storm Boy’s tale would be set within a contemporary framework, an additional layer that would give the story and its lessons a new resonance and relevance. This new storyline would imagine Storm Boy as a grandfather and extend the exploration of issues around land and the conservation of the environment. Screenwriter JUSTIN MONJO (THE SECRET DAUGHTER, SPEAR) was brought in to work on the adaptation, a process that would continue through the next several years. With an early draft script in hand, the producers began looking at possible directors, wanting to find someone who was passionate about the story and who would be able to draw out the delicate emotional nuances required of the performances and the storytelling. SHAWN SEET (TWO FISTS ONE HEART; DEEP WATER; THE CODE) came up early in discussions because of his body of work and his ability to work with actors to create complex performances. The producers were particularly taken with Seet’s deep and long-standing connection with the story. “When Michael Boughen asked me to come into the office and told me what the project was, it hit me like lightning,” says Seet. On reading the book again, as well as the draft screenplay, Seet was struck by the ways in which the story allows for a very intimate and individual experience. Sitting alongside Storm Boy and his father Hideaway Tom is the character of Fingerbone Bill, a Ngarrindjeri man. The participation and involvement of the Ngarrindjeri would be vital, as the film is set on their land, and represents their heritage and culture. The pelican (Nori) is a totem of the Ngarrindjeri. In Thiele’s book and in the 1959 narrative in STORM BOY, the environmental issue explored concerns whether a Coorong bird nesting area will continue to be designated as a hunting ground, or transformed into a conservation sanctuary. In the film’s contemporary narrative, the film touches on the issue of mining and its impact on the environment. To portray Michael Kingley — Storm Boy as an adult — in the present day scenes, Shawn Seet and the producers had one person in mind: Academy Award® winner GEOFFREY RUSH (SHINE, THE KING’S SPEECH, PIRATES OF THE CARIBBEAN). They approached the actor during development, in order to allow Rush to be involved in the process of refining the script. Geoffrey Rush had never seen the 1976 film, as he was studying in Paris when it was released and chose not to watch the film once he was on board. The key was to craft a script in which the transitions between the two periods were handled with deftness and purpose. The producers and director Seet wanted to shoot the film in South Australia, which would require support from the South Australian Government through the South Australian Film Corporation, as well as from Screen Australia. Multi-talented Jai Courtney has starred in many international feature films, making his international debut as Charlie in the action film Jack Reacher. He then went on to star in A Good Day to Die Hard, Divergent and Suicide Squad. He is currently appearing on stage in Melbourne Australia, starring in Shakespeare's Macbeth. Courtney has been cast as Hideaway Tom, a protective father who removes himself and his son from society and chooses to live on the remote coastline of the Coorong. Finn Little is an 11-year-old Australian actor born and raised in Brisbane, Queensland. Awarded the Outstanding Drama Performance in his age group for his character piece at the Brisbane Eisteddfod, Finn is making his feature film debut with STORM BOY. Geoffrey is among only 22 people internationally who have been awarded the Triple Crown of Acting – an Oscar, an Emmy and a Tony. He has received four Oscar nominations (The King’s Speech 2011; Quills 2001; Shakespeare In Love 1999 and Shine for which he won Best Actor in 1997). In 2005 his portrayal of the title role in HBO’s The Life And Death Of Peter Sellers earned him an Emmy, a Golden Globe and a SAG Award. In 2007 he starred in Ionesco’s Exit The King at the Malthouse in Melbourne and Belvoir Theatre in Sydney. After a triumphant season in New York in 2009, Geoffrey received a Tony Award as Best Actor for his Broadway debut. 2 AFI Awards, and two Helpmann awards for recent work in Australian theatre. Since 2003 he has played the swashbuckling Captain Barbossa in Jerry Bruckheimer’s Pirates Of The Caribbean series. Other international films include Gods of Egypt, The Book Thief, The Best Offer, Munich, Intolerable Cruelty, Frida, The Banger Sisters, Elizabeth, The Tailor Of Panama, Mystery Men and Les Miserables (1998). He currently serves as President of the Australian Academy of Cinema and Television Arts. In 2012 he was named as Australian Of The Year for his contribution to the arts, and was honoured as a Companion of the Order of Australia in 2014. Erik Thomson is one of Australia's most respected actors across film, television and theatre. He will next be seen in the third season of the highly popular series 800 Words for Network Seven. His other recent credits include Wayne Hope's feature Now Add Honey, the AACTA Award winning first series of The Code, and Rowan Wood's mini-series The Broken Shore adapted from the Peter Temple novel. Erik's film credits include Scott Hicks' The Boys Are Back opposite Clive Owen, Cate Shortland's Somersault with Sam Worthington, The Black Balloon opposite Toni Collette, Accidents Happen with Geena David, Beautiful and We're Here To Help. For his outstanding performance in Somersault, Erik was awarded the Australian Film Institute (AFI) Award for Best Supporting Actor in 2004 and was nominated for a Film Critics Circle of Australia Award for Best Actor in a Supporting Role. In 2008, Erik was again nominated for an AFI Award for Best Supporting Actor for his performance in the multi-award winning film The Black Balloon. Erik was also nominated for Best Actor in a Feature Film for We're Here To Help, and Best Actor in a TV Drama for The Million Dollar Conman at the 2008 NZ Film Awards. Erik was awarded the Silver Logie in 2016 for his performance as 'George Turner' in 800 Word and in 2003 for his performance as 'Dr Mitch Stevens' in the television drama series All Saints. He has been nominated a further seven times for the silver logie for Most Popular Actor Award and in 2011 he was also nominated for the Silver Logie for Most Outstanding Actor. Erik is well known for his role as the head of the Rafter family in Australia's top rating TV drama Packed To The Rafters and his other television credits include; The Alice, Blackjack, Dead Memory, MDA, Through My Eyes, The Million Dollar Conman, Wildside, 13 Gantry Road, Pacific Drive, Hercules and Xena: Warrior Princess. Erik's theatre credits include the sold out season of The Speechmaker for the Melbourne Theatre Company; The Splinter, Julius Caesar, Twelve Angry Men, All My Sons, Angels In America, School For Scandal, Hamlet, and Gypsy. Born in Subiaco, Western Australia, Trevor Jamieson is an incredibly multi-talented artist. An award winning actor across theatre, film and TV, he is also a didgeridoo player, guitarist, singer, dancer and storyteller. First seen on the screen in 1994 in the TV mini-series Heartland with Cate Blanchett, Trevor went on to star in Phillip Noyce’s Golden Globe nominated Rabbit-Proof Fence and Rachel Perkins’ Bran Nue Dae. Consistently working across both TV and film, he has also starred in the AACTA Award winning series Cleverman and the AACTA and Logie award winning series’ The Secret River and Lockie Leonard. Starring in over 30 theatre productions, in 2008 Trevor won the Sydney Theatre Awards best actor gong for his acclaimed production Napartji Napartji – a personal, multilingual, family story that he conceived and developed with Scott Rankin and Alex Kelly. He was also nominated in 2010 for Namatjira, which Trevor also performed at Southbank, London in 2013. In 2013, Trevor starred in the stage adaption of Storm Boy as Fingerbone Bill, in both Sydney and Perth as well as The Secret River. Most recently he was seen on stage in The Season, as part of the 2017 Sydney Festival. Award winning director, Shawn Seet saw the original Storm Boy after he moved to Australia as a boy of 12. The feature film, based on the celebrated classic novel by Colin Thiele has stayed with Shawn as a memorable and moving piece of cinema. Shawn's debut feature Two Fists, One Heart received critical acclaim and a Best Feature Film Direction nomination from the ADG. He has been awarded by the ADG for Drama Direction for Underbelly- A Tale of Two Cities and by AACTA for Best Direction Television Drama for The Code. The telemovie Peter Allen: Not the Boy Next Door for Shine and the Seven Network has garnered Shawn both AACTA and AWG wins for Best Director. Shawn's television credits include: The Secret Life of Us, Underbelly- A Tale of Two Cities, Business as Usual, Underbelly-Razor, Underbelly- Squizzy, My Place, Slide, The Mystery of a Hansom Cab, Camp, Love Child, The Code, Hiding, Deep Water and the Olivia Newton-John Telemovie. Matthew Street is Managing Director of Omnilab Media, Australia's privately owned, integrated media and entertainment company and Ambience Entertainment. Matthew's project credits include: KILLER ELITE (Robert De Niro, Clive Owen and Jason Statham); TOMORROW WHEN THE WAR BEGAN; THE LOVED ONES, DYING BREED; DYLAN DOG; DEAD OF NIGHT; Academy Award nominated THE MESSENGER; W and THE BANK JOB. Michael Boughen has worked as a writer and producer in the entertainment industry in the UK, New Zealand and Australia in his 35 year career. He has written stage plays, TV drama and films. He wrote and produced DYING BREED then produced THE LOVED ONES, TOMORROW WHEN THE WAR BEGAN and KILLER ELITE. He recently produced the 6 x 1 hour TV series TOMORROW, WHEN THE WAR BEGAN for the ABC. Justin is an award winning playwright and screenwriter. He has won four Australian Writer’s Guild Awards, a Green Room award and several overseas awards. His play “Cloudstreet” (with Nick Enright) was a National and International hit (playing in London twice, Dublin, NYC and Washington DC). Justin Co-Executive produced the most successful Australian/US television show ever, “Farscape” (winner of two Saturn awards), and his latest mini-series “INXS - Never Tear Us Apart” was the highest rating mini-series in Australia in 2014. In 2015 Justin had his mini-series “Peter Allen - Not The Boy Next Door” filmed along with the feature film directed by Stephen Page called “Spear”. Justin’s 2016 television credits include “Tomorrow, When the War Began” for the ABC, “The Secret Daughter” and the movie “Brock”. WHAT: To commemorate NASA’s 60th anniversary on Monday, October 1, 2018, Universal Pictures is treating audiences to free early screenings of FIRST MAN the riveting story behind the first manned mission to the moon, focusing on Neil Armstrong and the decade leading to the historic Apollo 11 flight. On the heels of their six-time Academy Award®-winning La La Land, Oscar®-winning director Damien Chazelle and star Ryan Gosling reteam for the film. WHERE: Markets that will host the special FIRST MAN screenings on October 1 include Phoenix, AZ; Orange County, CA; Palm Desert, CA; Riverside, CA; Sacramento, CA; San Diego, CA; San Francisco, CA; Simi Valley, CA; Ventura County, CA; Denver, CO; Hartford, CT; Washington, D.C.; Ft. Myers, FL; Miami, FL; Orlando, FL; Tampa, FL; West Palm Beach, FL; Atlanta, GA; Chicago, IL; Indianapolis, IN; Baltimore, MD; Boston, MA; Detroit, MI; Minneapolis, MN; Kansas City, MO; St. Louis, MO; Las Vegas, NV; Albuquerque, NM; Buffalo, NY; New York, NY; Charlotte, NC; Raleigh, NC; Cleveland, OH; Cincinnati, OH; Columbus, OH; Oklahoma City, OK; Toronto, ON; Portland, OR; Philadelphia, PA; Pittsburg, PA; Nashville, TN; Austin TX; Dallas, TX; Houston, TX; San Antonio, TX; Salt Lake City, UT; Norfolk, VA; Seattle, WA; and Milwaukee, WI. For more information and a list of theaters offering the special screenings, please visit Universal Screenings. FIRST MAN arrives in theaters nationwide on October 12, 2018. Gold Coast, Australia, August 10, 2018 — Paramount Players announced today that the motion picture adaptation of Nickelodeon’s Peabody Award-winning children’s animated series, Dora the Explorer, began principal photography on location in Gold Coast, Queensland, Australia, on Monday, August 6, 2018. The production, being directed by 11-time Emmy and four-time BAFTA nominee James Bobin (The Muppets, Muppets Most Wanted, “Flight of the Conchords”) marks the lovable Latina character’s big screen debut (and first live-action adaptation on any platform) after fourteen seasons (2000-2014) and 172 episodes on Viacom’s enduring children’s cable network. The film is a Paramount Players and Nickelodeon production in association withWalden Media. The film is being supported by the Queensland Government via Screenland Queensland. Paramount will release the film on August 2, 2019. Dora the Explorer stars Isabela Moner (Transformers: The Last Knight, Sicario: Day of the Soldado, Instant Family) in the film’s title role. Having spent most of her life exploring the jungle with her parents nothing could prepare Dora for the most dangerous adventure ever – High School. Always the explorer, Dora quickly finds herself leading Boots (her best friend, a monkey), Diego, and a rag tag group of teens on a live-action adventure to save her parents and solve the impossible mystery behind a lost Inca civilization. Seventeen-year-old actress Moner is joined in the film by one of Mexico’s biggest stars, Eugenio Derbez (Overboard, Instructions Not Included, How to Be A Latin Lover), who plays Alejandro, a mysterious jungle inhabitant who tries to protect the teenagers from the marauders. The film also features big screen newcomer Micke Moreno (Escobar: Paradise Lost), in the role of cousin Diego; Nicholas Coombe (“Spy Kids: Mission Control,” Midnight Sun) as Randy, a fellow high schooler who develops an immediate crush on Dora; Madeleine Madden (Picnic at Hanging Rock,”“Tidelands”) as the school’s snooty class president, Sammy; and Academy Award® nominee Adriana Barraza (Babel, Amores Perros, Thor, The 33) as Dora’s grandma, Abuelita Valerie. Temuera Morrison (Green Lantern, Moana) will play the role of Powell. Additional key casting announcements are forthcoming. The film is produced by Christopher Robin producer Kristin Burr, who is joined by longtime Bobin associate, executive producer John G. Scotti (The Muppets, Muppets Most Wanted, Alice Through the Looking Glass) as well as executive producers Julia Pistor (The Spiderwick Chronicles, A Series of Unfortunate Events) and Eugenio Derbez. Dora the Explorer will film entirely in Australia’s Gold Coast, in the state of Queensland on the continent’s east coast south of Brisbane. Village Roadshow Studios, where the production will headquarter, has been host to several major Hollywood movies in the last few years, including The Chronicles of Narnia: The Voyage of the Dawn Treader, The Shallows, Pirates of the Caribbean: Dead Men Tell No Tales, Marvel’s Thor: Ragnarok and, most recently, DC’s Aquaman. In addition to designer Hennah’s stage builds, the production will utilize Queensland’s diverse landscape, notably tropical forests near Tamborine Mountain and Tallebudgera, to portray Dora’s jungle habitat. Paramount Pictures is a subsidiary of Viacom. Nickelodeonis part of the Viacom Media Network, also a division of Viacom. Universal City, CA, May 9, 2018—In anticipation of its upcoming Mamma Mia! Here We Go Again, Universal Pictures today announced that free sing-along screenings of the blockbuster musical comedy Mamma Mia! will be available on Mother’s Day, Sunday, May 13, at 25 theater locations across the U.S. and Canada. Each guest who requests a ticket the day of the screening—at a participating location—will be given one free admission to the 10:00 a.m. showing, up to theater capacity. Free tickets will be available on a first-come, first-served basis and may only be picked up at the theater box office starting at 9:00 a.m. on Sunday, May 13. This offer is valid for the 10:00 a.m. showing of Mamma Mia! The Movie on May 13, at participating locations only. Markets that will host the special Mamma Mia! Sing-Along screenings on May 13 include Atlanta, GA; Boston, MA; Chicago, IL; Dallas, TX; Denver, CO; Detroit, MI; Houston, TX; Los Angeles, CA; Miami, FL; Minneapolis, MN; New York, NY; Orlando, FL; Philadelphia, PA; Phoenix, AZ; Sacramento, CA; Salt Lake City, UT; San Diego, CA; San Francisco, CA; Seattle, WA; Tampa, FL; Toronto, ON; Vancouver, BC; Washington, D.C.; and West Palm Beach, FL. For more information and a list of theaters offering the special screenings, please visit www.MammasDaySingAlong.com. Broadcast-quality clips from Mamma Mia! Here We Go Again are available at www.epk.tv, and stills are available at www.image.net. Meryl Streep leads an all-star cast in the feature-film adaptation of the beloved musical that has been seen by more than 30 million people in 170 cities and 8 languages around the world. Bringing the timeless lyrics and melodies of iconic super group ABBA to movie audiences, Mamma Mia! originally opened in theaters on July 18, 2008. The three women who created the worldwide smash stage hit—global producer Judy Craymer, writer Catherine Johnson and director Phyllida Lloyd—repeat their roles in bringing this joyful, musical story to the big screen. The Mamma Mia! film is produced by Judy Craymer and Gary Goetzman. Pierce Brosnan, Colin Firth, Stellan Skarsgård, Christine Baranski, Julie Walters, Amanda Seyfried and Dominic Cooper join Streep in this celebration of a mother, a daughter and three possible dads. An independent, single mother who owns a small hotel on an idyllic Greek island, Donna (Streep) is about to let go of Sophie (Amanda Seyfried), the spirited daughter she’s raised alone. For Sophie’s wedding, Donna has invited her two lifelong best girlfriends—practical and no-nonsense Rosie (Julie Walters) and wealthy, multi-divorcee Tanya (Christine Baranski)—from her one-time backing band, Donna and the Dynamos. But Sophie has secretly invited three guests of her own. On a quest to find the identity of her father to walk her down the aisle, she brings back three men from Donna’s past to the Mediterranean paradise they visited 20 years earlier. Over 24 chaotic, magical hours, new love will bloom and old romances will be rekindled on this lush island full of possibilities. Inspired by the storytelling magic of ABBA’s songs from “Dancing Queen” and “S.O.S.” to “Money, Money, Money” and “Take a Chance on Me,” Mamma Mia! is a celebration of mothers and daughters, old friends and new family found. Get ready to sing and dance, laugh and love all over again. Ten years after Mamma Mia! The Movie grossed more than $600 million around the world, you are invited to return to the magical Greek island of Kalokairi in an all-new original musical based on the songs of ABBA. With the film’s original cast returning and new additions including Lily James (Cinderella, Baby Driver), the musical comedy will open on July 20, 2018. Universal Pictures is a division of Universal Studios (www.universalstudios.com). Universal Studios is part of NBCUniversal. NBCUniversal is one of the world’s leading media and entertainment companies in the development, production and marketing of entertainment, news and information to a global audience. NBCUniversal owns and operates a valuable portfolio of news and entertainment networks, a premier motion picture company, significant television production operations, a leading television stations group and world-renowned theme parks. NBCUniversal is a subsidiary of Comcast Corporation. Every day, more than 4,100 dogs and cats are killed in America’s shelters, simply because they don’t have safe places to call home. Best Friends Animal Society is a leading national animal welfare organization dedicated to ending the killing. They believe that by working collaboratively with shelters, rescue groups, other organizations and you, we will end the killing and Save Them All by 2025. Click Here for the official CrowdRise page. 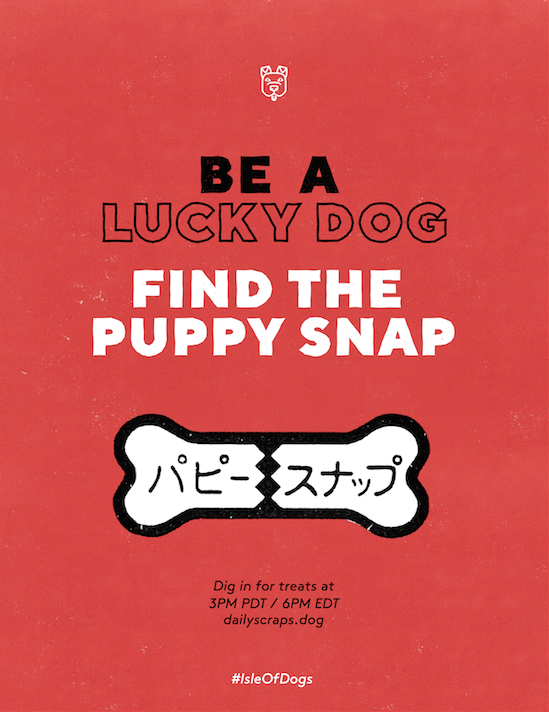 On behalf of Fox Searchlight, we're excited to share the below details for the Daily Scraps online experience on behalf of Wes Anderson's ISLE OF DOGS! Don't miss ISLE OF DOGS now playing in select theaters, expanding to more theaters weekly! ISLE OF DOGS is NOW PLAYING in limited theaters. In theaters nationwide Friday, April 13th. Universal City, CA, March 29, 2018—Universal Pictures, director Kay Cannon and the cast of Blockers, today announced that free “Spring-Fling” screenings of the new comedy will be offered on Wednesday, April 4, at 100 theater locations across 50 cities in the U.S. Guests who go to www.BlockersSpringFling.com and RSVP for a ticket—at participating locations—will be given one free admission to the 7:00 p.m. showing, up to theater capacity. Free tickets will be available on a first-come, first-served basis and may only be claimed at www.BlockersSpringFling.com. Each guest must present a printed ticket and show a valid ID to receive admission. This offer is valid for the 7:00 p.m. showing of the film on April 4, at participating locations only. Markets that will playing Blockers on April 4 include ones in Albuquerque, NM; Atlanta, GA; Austin, TX; Baltimore, MD; Boston, MA; Charlotte, NC; Chicago, IL; Cincinnati, OH; Cleveland, OH; Dallas, TX; Denver, CO; Detroit, MI; Fort Myers-Naples, FL; Fresno-Visalia, CA; Greenville-Spartanburg-Asheville, SC; Harlingen-Weslaco-Brownsville-Mcallen, TX; Honolulu, HI; Houston, TX; Indianapolis, IN; Jacksonville, FL; Kansas City, MO; Las Vegas, NV; Los Angeles, CA; Miami-Ft. Lauderdale, FL; Milwaukee, WI; Minneapolis, MN; Nashville, TN; New Haven, CT; New Orleans, LA; New York, NY; Norfolk, VA; Oklahoma City, OK; Orlando, FL; Philadelphia, PA; Phoenix, AZ; Pittsburgh, PA; Portland, OR; Raleigh-Durham, NC; Richmond-Petersburg-Hopewell-Colonial Heights, VA; Sacramento, CA; Salt Lake City, UT; San Antonio, TX; San Diego, CA; San Francisco, CA; Seattle, WA; St. Louis, MO; Tampa, FL; Tucson-Nogales, AZ; Washington, DC; West Palm Beach-Fort Pierce, FL. To find out more information, visit www.BlockersSpringFling.com. For more information and a list of theaters offering the special screenings, please visit www.BlockersSpringFling.com. When three parents discover their daughters’ pact to lose their virginity at prom, they launch a covert on-night operation to stop the teens from sealing the deal. Leslie Mann (The Other Woman, This Is 40), Ike Barinholtz (Neighbors, Suicide Squad) and John Cena (Trainwreck, Sisters) star in Blockers, the directorial debut of Kay Cannon (writer of the Pitch Perfect series). Students who participate in Warner Bros. Pictures’ and New Line Cinema’s LIFE OF THE PARTY Premiere Promotion can help bring the party—and the movie premiere—to their city simply by showing they have more school spirit than their peers at other colleges across the country. The Premiere Promotionlaunched online at www.LifeofthePartyPremiere.com and via all WB social arenas on March 8th. Just by posting a photo on a social media account depicting their school spirit and uploading it to the site, students will be eligible to make their school’s town the site of the LIFE OF THE PARTY World Premiere. Participants will also need to follow either the official “Life of the Party” Twitter or Instagram accounts (see links below) during the entirety of the Promotion to remain apprised of Promotion developments. In the spirit of March’s usual madness, entries will be accepted through 11:59 PM PT on Wednesday, March 21, 2018. On Friday, March 23, when the Top 25 universities vying for the Premiere will be announced on the website. Then the Promotion heats up between them, with the last school standing announced on Friday, April 6. Starring the eternally youthful Melissa McCarthy, LIFE OF THE PARTY tells the story of longtime dedicated housewife Deanna who, when her husband suddenly dumps her, turns regret into re-set by going back to college—alongside her daughter—and plunging headlong into the campus experience! It’s possible that no one is quite as spirited as McCarthy’s Deanna, but real students can give it the old college try by entering the promotion beginning today, and continuing to share with all their friends on social media channels, proving just who has the most school spirit in the U.S. One lucky university will then be selected to host the movie’s star-studded, red carpet world premiere in their city in advance of the film’s release in theaters on May 11. LIFE OF THE PARTY is directed by Ben Falcone and stars McCarthy, alongside Gillian Jacobs (“Don’t Think Twice,” “Love,” “Community”), Maya Rudolph (“Bridesmaids,” “Sisters”), Julie Bowen (“Modern Family”), Matt Walsh (“Veep,” “Ghostbusters”), Molly Gordon (“Love the Coopers,” “Animal Kingdom”), with Stephen Root (“Mike and Dave Need Wedding Dates”), and Oscar nominee Jacki Weaver (“Silver Linings Playbook,” “Animal Kingdom”), Jessie Ennis (“Better Call Saul”), Adria Arjona (“True Detective,” “Emerald City”), Debby Ryan (“Jessie”) and Jimmy O. Yang (“Silicon Valley”). McCarthy and Falcone co-wrote the screenplay and produced through their production company, On the Day. Chris Henchy also produced the film, with Toby Emmerich, Richard Brener, Michael Disco and David Siegel serving as executive producers. New Line Cinema Presents an On the Day Production, “Life of the Party.” Slated for release on May 11, 2018, the film will be distributed worldwide by Warner Bros. Pictures, a Warner Bros. Entertainment Company. It has been rated PG-13. BURBANK, Calif., Jan. 10, 2018— Marvel Studios’ “Thor: Ragnarok,” the God of Thunder’s third installment in the Marvel Cinematic Universe, electrified both audiences and critics alike reaching over $845M at the global box office.Now the colorful cosmic adventure, loaded with action, humor, drama and spectacle, bursts into homesDigitally in HD and 4K Ultra HD™, and Movies Anywhere, on Feb. 20 and on 4K Ultra HD™, Blu-ray™, DVD and On-Demand on March 6. “Thor: Ragnarok” features a star-studded cast that includes Chris Hemsworth (“Rush,” “In the Heart of the Sea”) who returns to the title role of the hammer-wielding hero of Asgard. He is joined by Golden Globe® winner Tom Hiddleston (“The Night Manager,” “Kong: Skull Island”) as Thor’s duplicitous adopted brother, Loki; two-time Oscar® winner Cate Blanchett (“Blue Jasmine,” “Carol”) as the villainous Hela; Emmy® nominee and Golden Globe winner Idris Elba (“Luther,” “Pacific Rim”) as the Asgardian sentry, Heimdall; Jeff Goldblum (“Jurassic Park,” “The Grand Budapest Hotel”) as the eccentric dictator, Grandmaster, ruler of Sakaar; Tessa Thompson (“Creed,” “Selma”) as the fierce warrior, Valkyrie; Karl Urban (“Star Trek” trilogy, “The Lord of the Rings: Return of the King”) as Skurge, one of Asgard’s strongest warriors; three-time Oscar nominee Mark Ruffalo (“Spotlight,” “The Kids Are All Right”), reprising his role of Bruce Banner/The Hulk from “The Avengers” and “The Avengers: Age of Ultron”; and Academy Award® winner Anthony Hopkins (“The Silence of the Lambs,” “Nixon” ) again portraying Odin, King of Asgard. “Thor: Ragnarok” is directed by Taika Waititi and is from a screenplay by Eric Pearson and Craig Kyle & Christopher L. Yost. Kevin Feige produces and is joined by executive producers Louis D’Esposito, Victoria Alonso, Brad Winderbaum, Thomas M. Hammel and Stan Lee. Waititi assembled a talented team behind the camera that included Oscar®-winning production designer Dan Hennah (“The Lord of the Rings” and “The Hobbit” trilogies) and production designer Ra Vincent (“What We Do in the Shadows”); six-time Goya Award-winning, BAFTA-nominated cinematographer Javier Aguirresarobe, ASC (“Secretos del corazón,” “The Others”); film editor Joel Negron (“The Nice Guys,” “Transformers: Dark Side of the Moon”) award-winning costume designer Mayes C. Rubeo (“Avatar,” “Apocalypto”); VFX supervisor Jake Morrison (Marvel Studios’ “Ant-Man,” “Thor: The Dark World”) and composer Mark Mothersbaugh (“21 Jump Street,” “The Lego Movie”). Movies Anywheresimplifies and enhances the digital movie collection and viewing experience by allowing consumers to access their favorite digital movies in one place when purchased or redeemed through participating digital retailers. Movies Anywhere brings together the movies from Sony Pictures, Twentieth Century Fox Film, The Walt Disney Studios (including Disney, Pixar, Marvel Studios and Lucasfilm), Universal Pictures and Warner Bros. Participating digital retailers at launch are Amazon Video, Google Play, iTunes and Vudu. Movies Anywhere offers a library of over 7,300 digital movies at launch, including new releases, and will continue to expand the consumer experience as more content providers, digital retailers and platforms are added. Using the free Movies Anywhere app and website, consumers can connect their Movies Anywhere account with participating digital retailers and enjoy their favorite digital movies from the comfort of their living room and across multiple devices and platforms, including Amazon Fire devices; Android devices and Android TV; Apple TV; Chromecast; iPhone, iPad and iPod touch; Roku® devices and popular browsers. Consumers can also redeem digital copy codes found in eligible Blu-ray and DVD disc packages from participating studios and enjoy them through Movies Anywhere. Universal City, CA, February 13, 2018—Filmmaker Jordan Peele, in conjunction with Universal Pictures, today announced free screenings of Universal’s Get Out on Presidents’ Day, February 19, at 55 AMC locations nationwide. Each guest who requests a ticket the day of the screening—at a participating location—will be given one free admission to the 7:00 p.m. showing, up to theatre capacity. Since its release in theatres in February 2017, Get Out has been nominated for four Academy Awards®, while inspiring audiences and artists worldwide. A compilation video was also released that showcases the artwork inspired by Get Out—featuring the hashtag #GetOutOneYearLater—to encourage audiences to share more of their artwork, experiences and discussions that were influenced by the movie. The promotion will be available at each of the 55 AMC Theatres playing the special screening of Get Out at 7:00 p.m. on February 19. Free tickets will be available on a first-come, first-served basis and may only be picked up at the AMC box office that day. Each guest must present a valid ID to receive their ticket, with a limit of one free ticket for each ID presented, while supplies last. This offer is valid for the 7:00 p.m. showing of the film on February 19, only. Markets that will playing Get Out on Presidents’ Day include ones in Atlanta, GA; Baltimore, MD; Boston, MA; Charlotte, NC; Chicago, IL; Cincinnati, OH; Columbus, OH; Dallas, TX; Denver, CO; Detroit, MI; Houston, TX; Indianapolis, IN; Jacksonville, FL; Kansas City, MO; Los Angeles, CA; Miami/Ft. Lauderdale, FL; Minneapolis, MN; Nashville, TN; New Orleans, LA; New York City, NY; Oklahoma City, OK; Orlando, FL; Philadelphia, PA; Phoenix, AZ; Pittsburgh, PA; Raleigh/Durham, NC; San Diego, CA; San Francisco/Oakland/San Jose, CA; Seattle/Tacoma, WA; St. Louis, MO; Tallahassee, FL; Tampa, FL; and Washington, D.C. To find out more information, visit www.getoutoneyearlater.com. For more information and a list of theatres offering the special screenings, please visit www.getoutoneyearlater.com.